Today’s post comes from Kyle Sater, Senior Educator for Public Program Development at the Adler Planetarium. Kyle’s enjoys making STEM fun and relevant for everyone, especially when it involves Star Wars and legos. He lives in Chicago with his wife, who is also an educator, and his lovable cat Boots. It’s a funny thing: Einstein was usually right. His General Theory of Relativity predicted that gravitational masses can alter the direction of light, creating strange lensing effects in deep space. In short, light can be bent and we can see those effects—sometimes arcs, sometimes full-on rings, in far-away galaxies. In 2013, the Adler premiered Cosmic Wonder, full-dome sky that takes guests on a journey to the far reaches of space—to places like enormous galaxy clusters, some which are acting as gravitational lenses because of their gravitational mass (with the help of elusive dark matter). To further the experience for guests after the show, the Public Programs department developed a cart program that attempted to make lensing more…tangible. 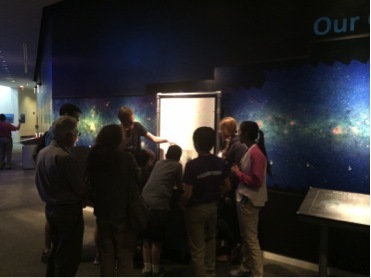 As you can imagine, the challenge was taking a relatively abstract concept, like gravitational lensing, and creating a museum program suitable for guests with different background knowledge. At the Adler we engage in “backward design,” meaning we develop 1 or 2 large learning goals and work backwards to find instructional methods that will work on the floor. 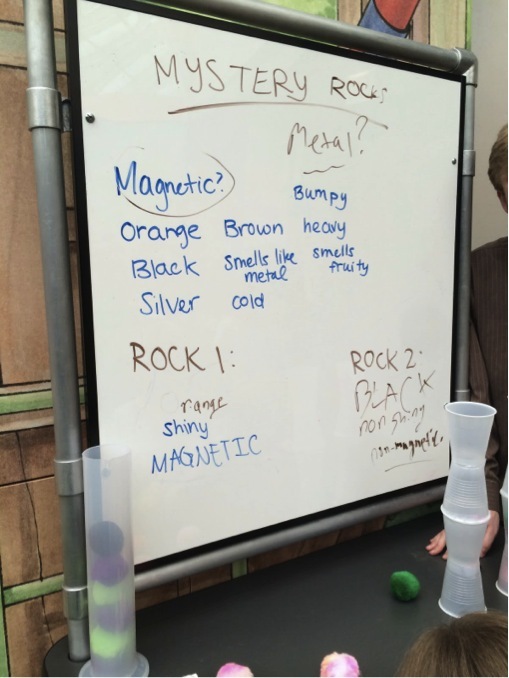 But we also value inquiry-based exploration and want guests to have fun! So we started with a basic premise, “How can we detect the invisible?” and “How can light be bent?” and create experiments to explore these concepts. In this case, we utilize a quilting frame with taught fabric interwoven with a battery-powered light strand, and placed a heavy object (billiard ball) on the fabric. This helps illustrate that, even if we can’t see an object, its mass “warps” space-time and can bend light. As a follow up, we challenge guests to use a special acrylic lens and a laser to create their own “lensed objects” on the exhibit wall. 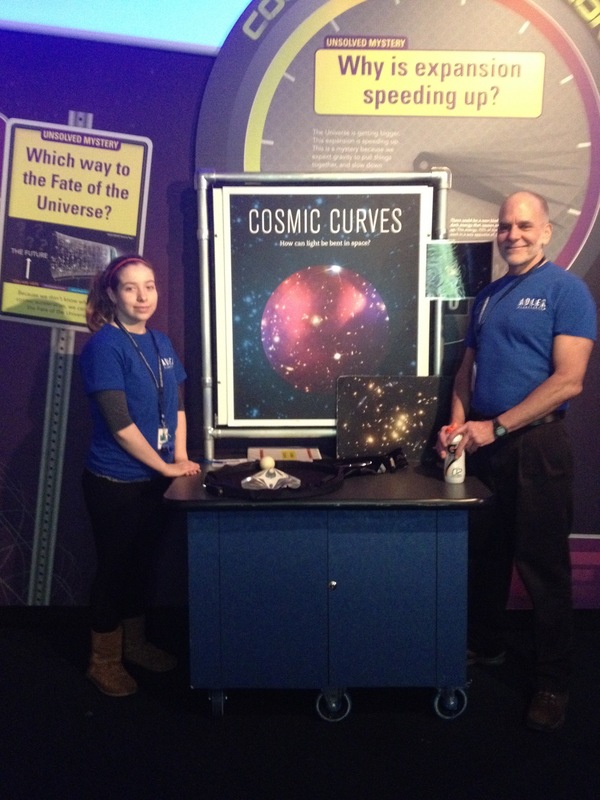 Adler Planetarium floor interpretation volunteers ready to engage museum guests with Cosmic Curves. Our in-house team of facilitators, Mission Specialists, are crucial to the success of floor programs like Cosmic Curves. This program, more than others, requires a comfortability with the content, especially since they’re talking about cutting-edge topics in cosmology. And even then, guests can always surprise you! After all, a 1st grader and a grad student studying physics are coming from vastly different places. Zooniverse projects, like Space Warps, and apps like GravLens only further the experience for our guests. So get classifying on spacewarps.org or learn more by coming to the Adler! Today’s post comes from Annika Moe. Annika is a post-doctoral fellow in the College of Biological Sciences at the University of Minnesota and has a background in Ecology, Evolution and Behavior. She is currently working to incorporate authentic research experiences into courses for non-biology majors and incorporate learning technologies into the classroom. ‘What is that?” My officemate crossed the room and squinted at the image on my computer. “I’m calling it a Hartebeest. They seem to always be standing around under trees. This camera’s probably fixed to a tree” and I clicked on the “Next capture” button. “Trotsky!” we both sang out as we watched a lone warthog plod half-ways across the screen. We had decided it was an appropriate name for the jolly looking animal that kept appearing at a number of different camera sites. Next capture. This went on for a couple hours as I familiarized myself with Zooniverse’s Snapshot Serengeti project. I couldn’t stop pressing that button… Next capture… Next capture… It was addicting. Something about this experience was transporting me across the world and tapping into a child-like sense of wonder that I hadn’t felt in a long while. Snapshot Serengeti was a perfect fit for what I wanted to accomplish. “Incorporate an authentic research experience into a laboratory course for non-biology majors.” This was the charge I was given when I arrived at the University of Minnesota in the fall of 2012. With funding from the Howard Hughes Medical Institute, the College of Biological Sciences had hired a group of post docs to tackle this challenge across a number of the “non-major” courses offered by the Biology Program. With a degree in ecology and evolution, I made a beeline for BIOLOGY 1001: Ecological and Evolutionary Perspectives. What fun! Working with my favorite student demographic (non-biology majors) on my favorite subjects! It would be a great challenge. This may be the only biology class these students take during their college education. Many may believe that they have no interest in or talent for science. They could be future engineers, business leaders, teachers, politicians, computer scientists, comedians, or journalists. What do we want these students to take away from their one biology class? What is an authentic research experience, and can students authentically experience science in such a short time? I had recently read a paper by a group from Stanford University  that gave a number of suggestions for successfully integrating faculty research into undergraduate biology education. Snapshot Serengeti met some of the more challenging suggestions. Low barrier of technical expertise for students to collect data Check. Snapshot Serengeti has an intuitive user-interface and tutorial tools. Students can learn to collect data with little to no instruction. Established checks and balances for student-collected data Check. Snapshot Serengeti has a data quality control system of multiple identifications and ID confirmation through consensus. Diverse, but constrained set of variables for developing hypotheses Check. The data collected by the Snapshot Serengeti project consists of a manageable number of variables and metadata associated with camera locations. The nature of the data generally directs investigations toward asking questions about distribution patterns over time and space. Central database accessible to all students Check. The researchers behind the Snapshot Serengeti project are led by Dr. Craig Packer, professor of Ecology, Evolution and Behavior and instructor of BIOL 1001 at the University of Minnesota. The current quality-checked data set from Snapshot Serengeti is readily available to our students. And so I prepared a six-week laboratory module in which students used the Snapshot Serengeti project to make observations and collect data, generate testable questions and investigate those questions using the combined data from all Snapshot Serengeti participants. While it is impossible to experience all aspects of scientific research in six weeks, the module uses exploratory research and observational study to highlight a few key pieces of the process. The first two weeks are spent exploring, observing and wondering about Serengeti wildlife. Students read and discuss scientific papers on Serengeti ecology. They learn about trophic dynamics and interactions through building a Serengeti food web. Students spend time using the Snapshot Serengeti website and practice generating observations and questions from both individual photos and sets of photos across space and time. From this pool of experiences, students draw on their own intellectual curiosity and understanding to form their research questions. The third week introduces the students to the Snapshot Serengeti database. Students are given instruction on how to use the data filter and graphing functions in the statistical program Jmp. They are given time to explore the data and computer program to try and address a few testable questions given to them at the start of the lab session. Students compare different data visualization methods and discuss their relative utility in displaying different types of data. During the fourth and fifth weeks, students work in groups to investigate a set of their own questions, organized around a theme in Serengeti ecology. Groups are let loose with the database and Jmp program to investigate their questions and prepare a presentation of their findings. During these two weeks, Students experience the challenge that researchers face in identifying the data that truly addresses their questions and organizing the data to test their ideas. In the final week, groups present their research to the class and reflect on what they’ve learned about the nature of science and the research process. 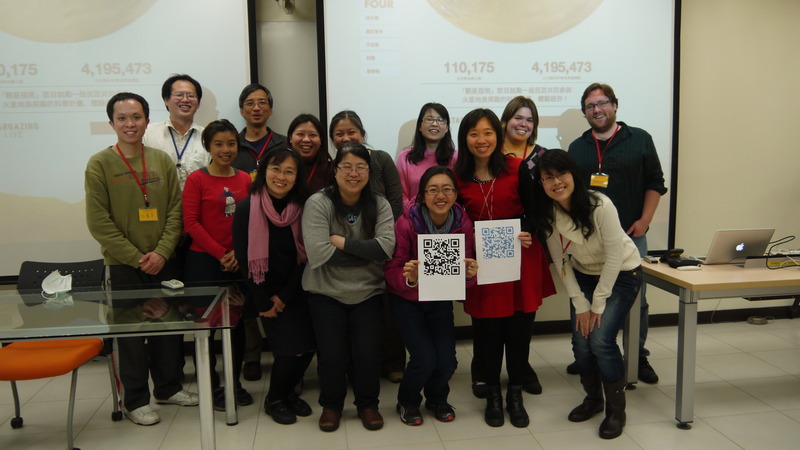 During Fall of 2013, we piloted this module in 3 lab sections involving 59 students. I had no idea what the students would take away from the six weeks of working with the Snapshot Serengeti project. The assignments were open-ended and students largely left to figure out how to address their questions without explicit instruction. I expected that they would be confused, frustrated and perhaps even angry. I was afraid that working with a giant spreadsheet of numbers would bore them. I was hoping for something great, but prepared for a disaster. I was shocked by what I saw during the pilot of the module. Students were huddled over their computers for the entire two hours of each lab period, working furiously to find patterns in their data. They were on task, engaged and asking questions. I was even more amazed when I asked what they had learned from their experience. Reflecting back on some of my initial questions about what makes a research experience “authentic”, the answer really isn’t that complicated. Scientists have the freedom pursue the questions that interest them and the freedom to follow where those questions lead. Give students the tools to ask and investigate questions, then give them the freedom to be a scientist. Zooniverse and Snapshot Serengeti offer an amazing exploratory platform from which to awaken curiosity and dive into the scientific process. Kloser, M.J. et al. 2011. Integrating Teaching and Research in Undergraduate Biology Laboratory Education. PLoS Biology. Vol 9:11. e1001174.